The current tendency to embalm our historical monuments, trying to maintain them precisely as they were in their functional lives, is a relatively new practice. Most of the great monuments of ancient Rome were adapted in the middle Ages for re-use in some "parasitical" way related to their basic form and system. The Coliseum became a large scale apartment block as well as a stone quarry. Domitian's Arena was converted to the hippodrome-shaped Piazza Navona with stores resting their foundations and partitions on the surrounding groins and vaults. Similarly, so that it can stave off future threats of demolition and floods, the new extension is meant to provide income for its own maintenance. One wonders though how much the eggs will have to cost to pay for heating and to replace broken windows. 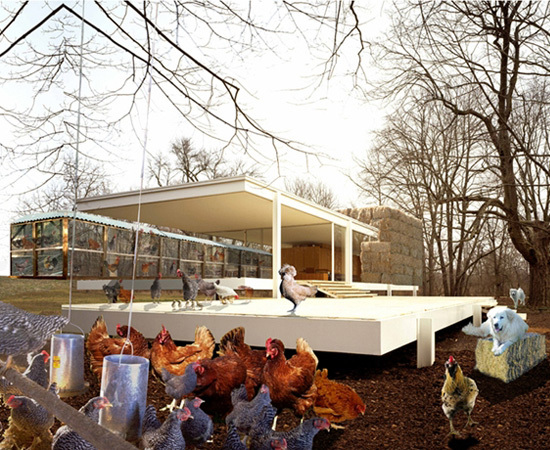 Meanwhile, someone should propose retrofitting Philip Johnson's houses in New Canaan, Connecticut into a boutique abattoir. Organic spring lambs reared in an Arcadian setting, then slaughtered with modernist efficiency. Johnson's Loins® for $500/lb. Or genetically modified pigs nurtured in Johnson's “perfected” landscape, then ensanguinated in hermetically sealed glass hamlets, their butchers soothed from the horrors of blood and squealing with an enveloping view of Nature.